What nourishes a black rose? Is it pristine, clear water, or is it something else, something darker? This Black Rose Dew Gothic Zipped Hoodie shows off a beautiful black rose adorned with a morning dew that is far from normal. Bursting through the shadowy tatters, this dragon emerges in ferocious style! The Breaking Out Dragon Hoodie is ideal for bringing fantasy tastes into your everyday wardrobe, made of comfy and soft 100 percent cotton fleece. 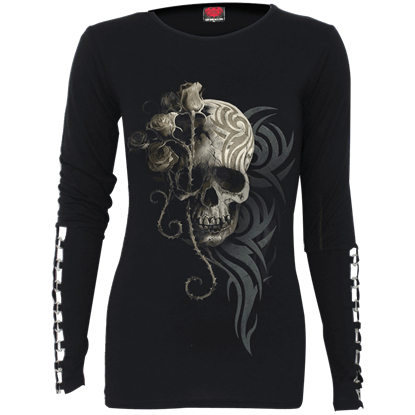 For a striking display of gothic style, the Dark Angel Buckle Cuff Long Sleeve Top calls forth a powerful aura to ward off unwanted encounters. This modern take on classic gothic style features unique sleeves and an impeccable graphic. Usually, when you hear the term lost soul, you think of someone broken, who has lost their way. 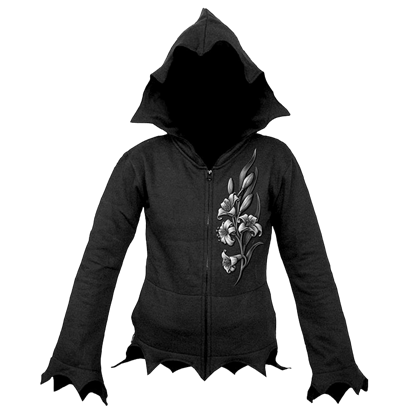 In some ways, the vibrant gothic design of this Lost Soul Womens Gothic Zipped Hoodie depicts an angel who is, indeed, very lost. Bring sweet fantasy style into your everyday wardrobe with the Sacred Love Womens Unicorn Hoodie. Its gorgeous front graphic shows a tender moment between two unicorns, while the rips on the front and shoulders add just enough edge. 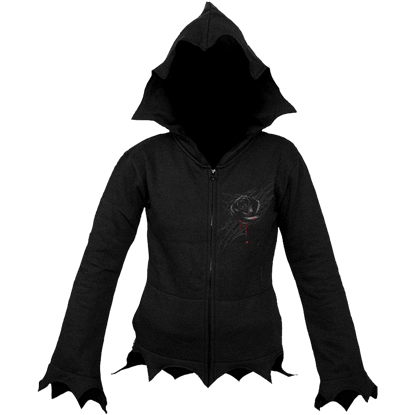 If you want to become part dragon, then there is no better way to then to don this Serpent Infection Womens Gothic Hoodie. You never know, it might infect you with some of its style, which will slowly start your transformation. Dare you enter the vampires mansion lair? 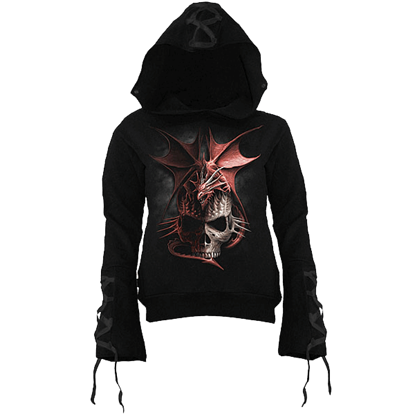 The Vamp Fangs Lace-up Full Zip Hoodie features eye-catching gothic vampire graphics on its front and back while grommets and lacing down the sleeves and on the hood make a fearsome statement. Bring a rugged vibe into your casual goth and cold weather wear with the Womens Distressed Gothic Hoodie. This black pullover hoodie has a grey spray gradient over the top of the chest and laser cut distressing over the shoulders. Give your wardrobe an upgrade in both edge and comfort when you zip up the Womens Lace-Up Sleeve Black Glitter Hoodie. 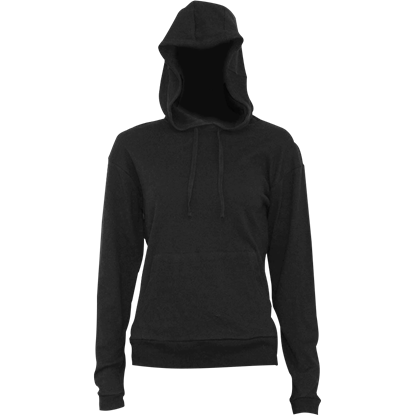 This full zip gothic hoodie is made of a soft cotton blend fleece and has dramatic lacing down the entire sleeves. 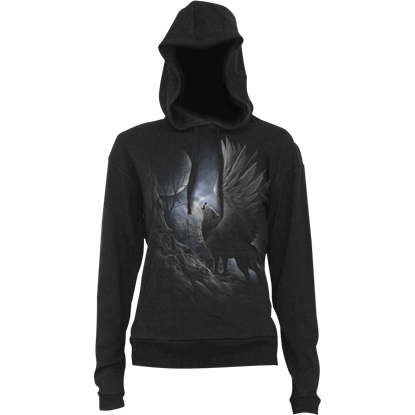 Featuring a splendidly colorful and vivid design, the Womens Lycos Wings Hoodie depicts a gray wolf celebrating its new wings.  This sweatshirt is both eye catching and comfortable, making it a superb addition to any wardrobe. Striking a magnificent blend between gothic styling and comfort, the Womens Metal Streetwear Hoodie features an all-black minimalist design which is sure to complement your style while keeping you warm and relaxed.